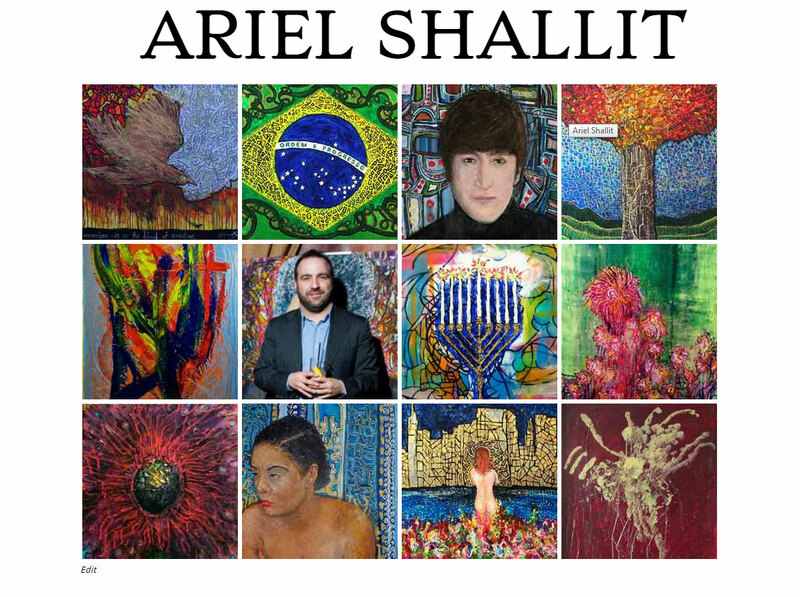 Update: July 4, 2016: Unfortunately, Ariel Shallit has still not paid me for my work. This artist got paid for a commission, took the in-kind services, but did not fulfill the commission. I did not pursue this matter aggressively. I trusted that the artist valued maintaining the integrity of our personal relationship as well as his own reputation as a professional. Since years have elapsed since the debt began, one can conclude the artist has no intention on paying me for my work. Lesson learned: Never work without a written contract. I seldom build websites start to finish without a team of experts who work on each component separately. On this particular occasion, I decided to build one on my own to help out an artist friend of mine who needed an update. What started out as a simple project became increasingly more complex. This post will walk you through the entire process. The artist had a design that was built in Flash. The art displayed was extremely small by modern standards, did a poor job of displaying his work and did not function on Apple devices. In order to keep it current and up to date, It required the artist be familiar with AppleScript and FTP. As a result, the site was stale and several years out of date. Install and create an updated website incorporating modern best of breed functionality by customizing pre-made templates. After consulting with the artist about his vision and technical requirements, I decided WordPress would be a suitable system for the task because it is easy to use. WordPress is an excellent solution for websites that require sustainability, expansibility and long-term upgradability. Content management should require as little effort as possible, driven by taxonomy. The site should be able to post to social media in tandem with new posts in order to cross-promote content. I presented the near final design to the artist. It was rejected because the design was too busy. He wanted something far more simple and cited Salon.com as an example for my base aesthetic. Unfortunately, with a hard-drive failure, I did not keep a working copy of my work. You can see a demo here. I went back my browser and looked for a base theme that was reminiscent of Salon.com. I wasn’t sure how I was going to adapt a Salon look and feel on a site that largely emphasized images. Salon has very different types of content. 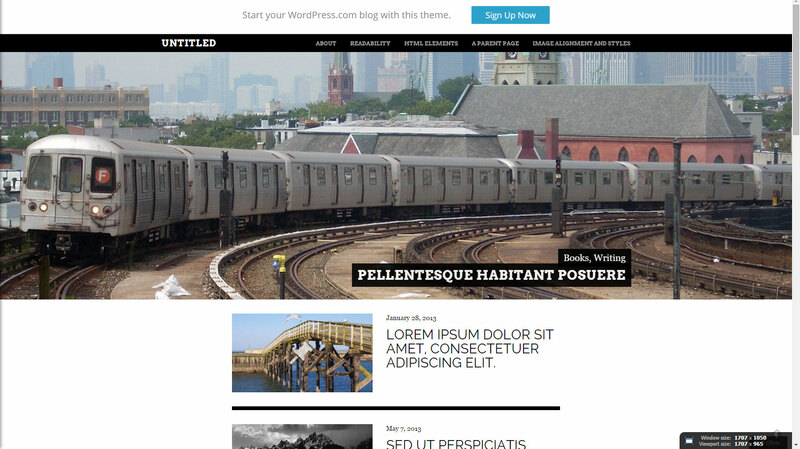 I expressed concerns that this aesthetic would not translate well for an image-driven website. The artist was adamant that this is what he wanted. When I emailed him an early prototype, he agreed that this is what he envisioned, and where he wanted to go. I continued. I believed the only way to make this text-heavy design work on a portfolio website is to incorporate text. This was an opportunity to expand beyond brochure-ware and build a real functional website that would gain traffic organically. The artist had begun blogging his thoughts on Tumblr. His former career incorporated almost all aspects of media including time spent as a composer, lyricist (aka poet), and a music and video creator and producer, both independent and for large advertising agencies. He also has a large collection of personal writings and poetry. I reasoned that there was plenty of content available and weaving it into his website would bring in more traffic which in turn make his work more visible. His multi-disciplinarian talent remains awe inspiring. Publishing his writings and other creative outputs seemed like a good way of bringing in traffic and opening up new commission opportunities for people who weren’t already familiar with his work. One of the impressive things about the parent theme was the incorporation of full-bleed images in the header with a thumbnail slider (not shown here). Unfortunately, for my purposes this was not useful. In order to remove them, I had to write new functions and css into the child theme. I don’t normally write custom PHP code so this took some time. I also changed a few elements on the page, made the thumbnails larger, incorporated finer lines between posts and dozens of other small details. The result is below. This was the blog component of the website that allowed the artist to keep content up to date and feed the search engine new content. Unfortunately, this theme did not support many of the functional requirements of the original specification. This meant I had to build out the functionality manually which became a much larger job than the original agreement. The artist and I discussed this and he agreed he would paint me a larger portrait in exchange for the work. Simultaneous broadcast of new posts on WordPress, Facebook, Tumblr, Pinterest and Google+. 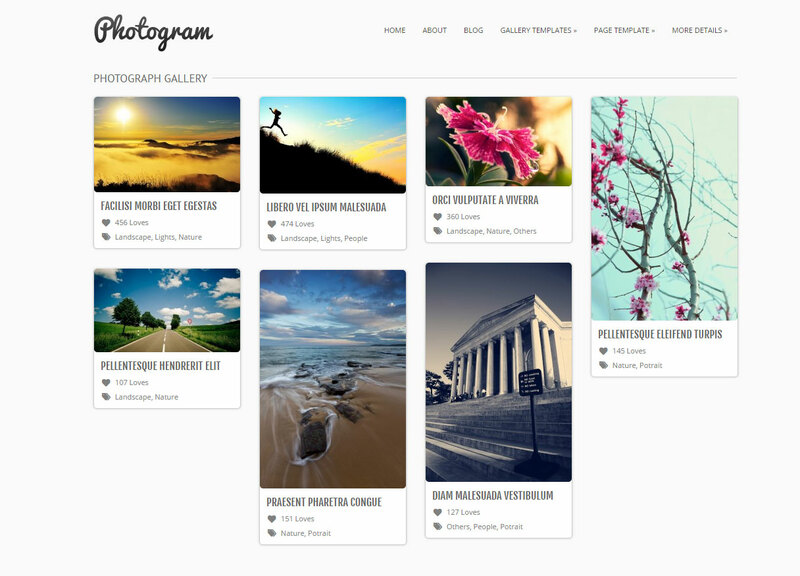 Full gallery functionality that utilizes native WordPress shortcode for media. This spec was required because the artist strongly pressed that he needed content entry to be simple. In my research and testing, I was surprised how few plugins used WordPress native short code, how many were difficult to configure and how many were inflexible. I ended up using Carousel, a sub plugin of Auttomatic’s Jetpack which had a lot of other pre-built functionality. Enable Media Replace: This enabled images to simpy be replaced. Media Rename: In order to maintain quality SEO, file naming was important. I didn’t want the artist to have to re-upload the images in order to rename the file. WordPress Media Tags: This enabled the media to be tagged with hashtags for SEO purposes (not shown in the image below). The media administration screen with added extras, tagging, rename file and tag id. Photos would be no larger or wider than 1000 pixels. Photos would be saved in Photoshop using save for web as a jpg with the progressive check boxed marked. Finally, I would try to keep each files under 100K. This greatly improved performance, but not enough. There were a few problems with the Carousel’s display on an iPhone4. I worked closely with the plugin authors to resolve it. In turn, they informed me about a useful sister module called Photon. Photon took all images, created smaller copies of them, and delivered the device appropriate sized image to the user through what is called a CDN, (Content Delivery Network). This was a fantastic discovery and greatly improved performance. While I was working out optimal file optimization protocol and Photon, I decided to upgrade the servers. I had been experiencing random errors, especially when loading new plugins. The catalyst for change was the inability to set simple permissions for files on the server which is a huge security issue. I knew the problem was a result of the server being on Windows. I called the web host and worked closely with them first to upgrade from WIndows to Linux, and then followed up with a second migration that moved it to a virtualized server. Each move created some rendering problems, which I was able to solve quickly. The end result was a site speed improvement by more than double. The artist noticed the speed increase right away. Jetpack also came with another plugin called Publicize. It incorporated check boxes next to the Publish button allowing the author to publish new content to his social networks with one click of a button. This was one of the only plugins that was easy to configure, did not require a custom API, and incorporated multiple social networks. It was very easy to use. 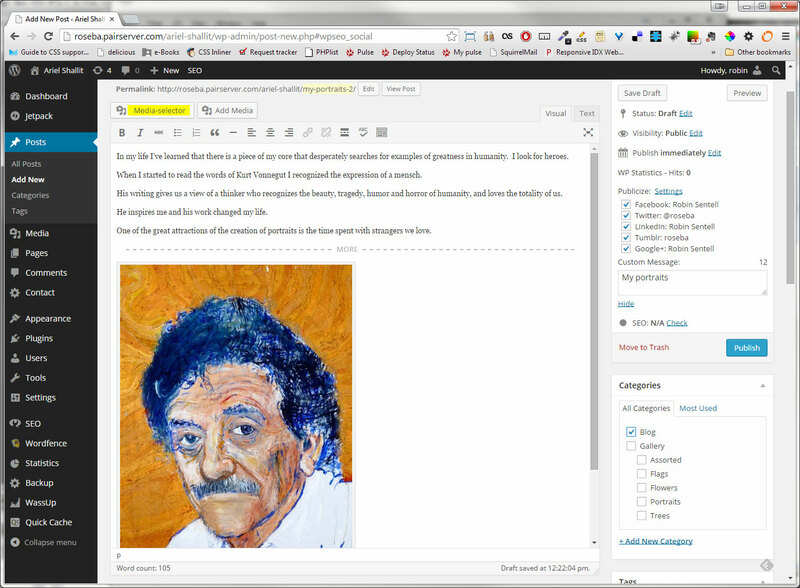 This image shows the content entry page including the social media share component and the tagging component below. The artist was adamant that the content should be as easy to publish as possible. He wanted to post an image and have it automatically add itself to a gallery by use of keywords. This was a very difficult problem to solve. 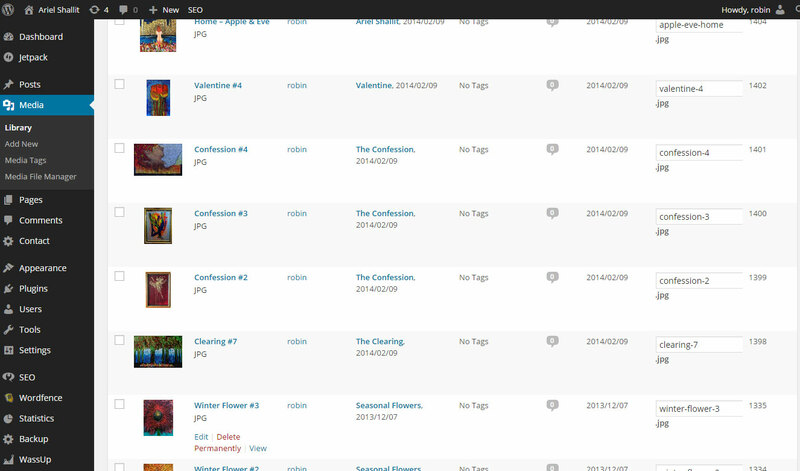 While I wasn’t able to tag each piece of media and have it assign itself to a gallery, I was able to build categories of galleries by keyword, separating different types of art using keywords and a dropdown menu. This eliminated a traditional landing page with thumbnails and made the process two steps rather than three. Before launching, I incorporated other features. A streamlined url structure so that the links were as short and concise as possible. There were many other tweaks that I added to this site that I have not listed here. 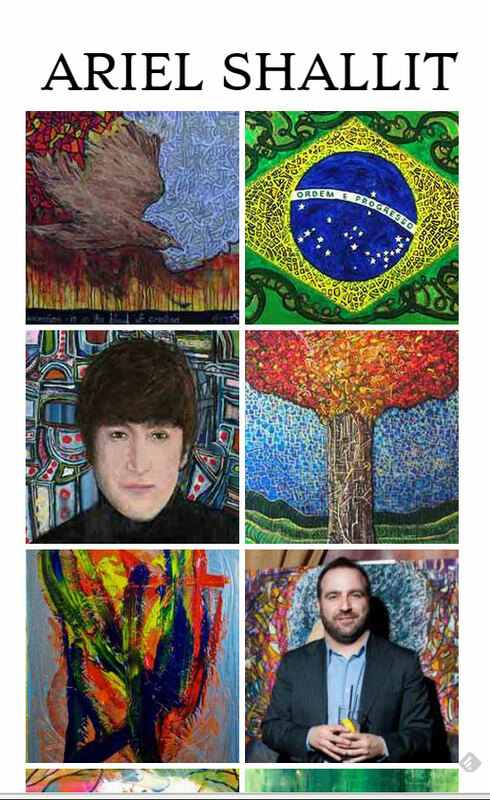 The artist expressed that he did not like the home page which consisted of a blog style page with thumbnails. He wanted it to have more impact. This posed another problem to be solved. How does one create a splash page of images on a responsive website where images are not responsive elements? After several trials and errors with different ideas and designs, I came up with an idea to display a grid of thumbnails that would change size and the number of items displayed on a grid adapting to the viewport size. The images could be swapped in an out as needed as a way to keep the design fresh, and up to date with fresh content. The first shot is on a desktop, while the second is a rendering on a mobile device like a Samsung Galaxy 4. The home page on a desktop. The home page on a large mobile phone like the Samsung Galaxy 4. The site was launched and the artist said he was very pleased with the work. We discussed making some minor changes to the typography. We were never able to schedule a mutually convenient time to hash it out and get the work done but we both considered this change it a minor cosmetic issue. We did not give it priority. A few months after launch, the artist asked if I could incorporate e-commerce onto the site. I said it could be done, but I didn’t want to be the person to do the work and, it was way out of scope. There are many e-commerce plugins available in WordPress. Most require a payment even to try them out. Since I have never built an e-commerce site, I was not comfortable with the liability involved with credit card transactions. I felt his needs would be better fulfilled by someone who was already familiar with e-commerce plugins. The artist expressed that this was a low priority request for the distant future so I needn’t be concerned about it. The site was live for approximately nine months when the artist replaced it with a new site. He explained that he changed his mind about the aesthetic and wanted a platform that incorporated e-commerce easily. It was a little disappointed given the amount of work I did on the site. I built it to last many redesigns which is why I dedicated so much time to getting the administrative details right. The theme could have easily been changed, and if coerced, I probably would have capitulated on the e-commerce portion of it. 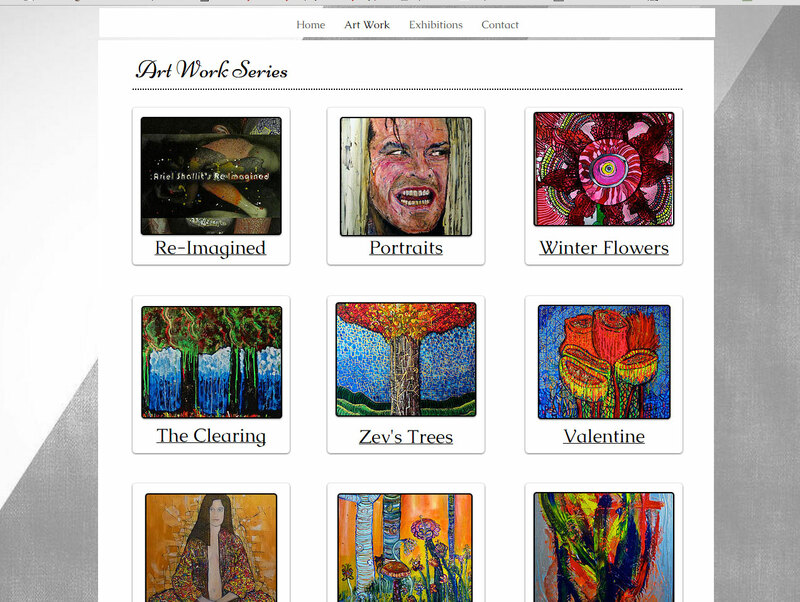 Below is his new website built with a Wix builder. The following photo gallery incorporates many of the screen shots from this post and a few additional shots that demonstrate the depth of the work. Thank you for reading. Customized 404 page. No detail unexamined. 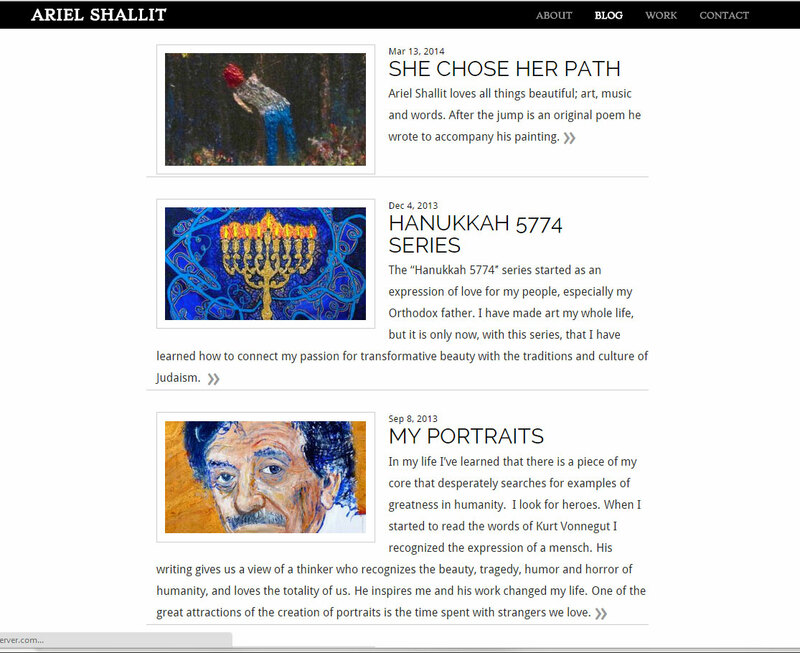 A view of the gallery edit page.